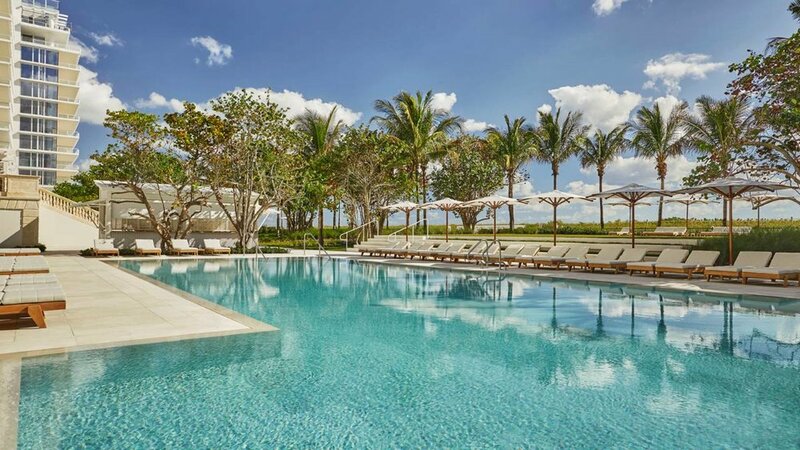 After a five-year renovation and expansion, North Miami Beach’s Surf Club reopened as a Four Seasons Hotel and Residence in March 2017; the original 1920s clubhouse remains at its heart, while five Richard Meier–designed glass towers house the sparkling new guestrooms and residences. French designer Joseph Dirand is behind guestrooms' modern minimalist style in a palette of creams and jade green, with floor-to-ceiling windows framing city or ocean views. Location in North Miami Beach puts you close to all the shops of Bal Harbor and a 20- to 30-minute drive to South Beach. Foodies take note: Le Sirenuse Miami is the premier outpost of its namesake, Michelin-starred Positano restaurant, housed beneath the restored loggia of the original clubhouse. Plus, a Thomas Keller–helmed restaurant will open in early 2018. Choice of three pools—the Cabana Pool, Family Pool, and Quiet Pool (adults only). Pampering for all: For adults there’s the gorgeous spa and hammam; for kids, the complimentary Kids For All Seasons program in a dedicated club room steps from the pool. Tower Rooms occupy the Meier-designed glass tower above the original clubhouse; all have private balconies, ensuite marble bathrooms, and city or ocean views. Surf Club Rooms connect to Premier Oceanfront Rooms to create a spacious suite; cribs are permitted in Surf Club Rooms and rollaway beds in Premier Oceanfront Rooms. Young guests are treated to pint-sized bathrobes, a welcome amenity, and bath toys, and staff can also organize baby-proofing, use of a highchair and stroller, swim diapers, a video library and more. Le Sirenuse Miami is open for breakfast, lunch, and dinner, and children’s menus are available, but it’s worth booking a sitter and enjoying the gorgeous Champagne bar and old-Havana-meets-Positano interiors. Only Oceanfront Rooms have bath tubs. The five Cabana Studios are smaller than Tower Rooms, but are closest to the beach and have the most retro style.